Join the Rat Race this summer at Barleylands! 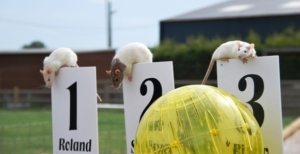 Roland, Rizzo and Splinter, Barleylands new racing rodents, scampered out of their enclosures in the animal barn and into their special racing balls to take part in a warm up race and battle it out to be first past the post this week. Alongside racing colourful sheep and cheeky goats, Barleylands Farm Park are adding the wacky Rat Races to our daily animal activities this summer starting from 20 July. The races will take place twice a day straight before the colourful Lamb National. The rats have been introduced to the balls over a number of days and are now eager race participants. As rats are both extremely active and intelligent this addition into their daily routine not only gives them an extra source of exercise but also brain stimulation. Their ‘race track’ is a raise platform which is approximately 5 metres long and their racing balls are specially designed for rats, so they are much bigger than the more common hamster balls, and allow the racing rodents plenty of space. Over the summer holidays Barleylands Farm Park will have six different themed weeks Monday to Friday full of extra fun and activities and the Rat Race will run across all the weeks and the weekends. Click here to find out more.